I have my own personal barista making me seriously good cappuccinos every morning and that has become something that’s hard to give up when we leave home for any reason. When we have gone backpacking, we’ve used little packets of concentrated espresso that we just pour into hot chocolate or something. It’s not like home, but it’s caffeine, and when you’re backpacking, you don’t expect to be comfortable. When we’ve gone bike touring, finding good (or at least acceptable) coffee is always the first order of business every morning. Some mornings are better than others, and the reality is that we’ve both learned not to talk to each other until Mission #1 has been accomplished. So now that we’re moving into a whole new realm of comfort with Dory, we’re looking for ways to keep that morning “Ah” as close to what we’re used to as possible. We figure if we can do this, then truly extended periods of being away from home will be more fun. Richard began researching morning coffee almost instantly after we placed the deposit on Dory. Our arrival at the present coffee candidate was more a matter of a process of elimination than a direct route. 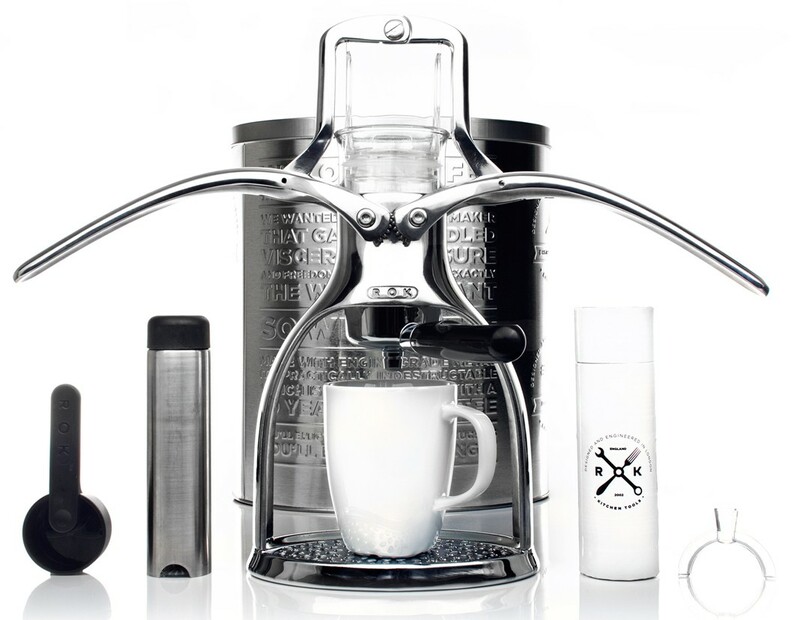 We knew we’d be happier with something that made actual espresso rather than French press type coffee. Yes, we have a “camping” French press. We also wanted to avoid needing to use loose grounds since that would mean having to figure out a portable grinding solution or having pre-ground coffee that would go stale very quickly. Yes, we have an Italian stovetop coffee maker. So that led to some of the handle pressured or tire pump type gadgets out there. We tried a Rok espresso maker where you pour a tiny amount of hot water into the top and plunge some big arms down, squishing the water through the grounds. This was when we decided for sure we didn’t want loose grounds. Remember: we drink at least four shots every morning. 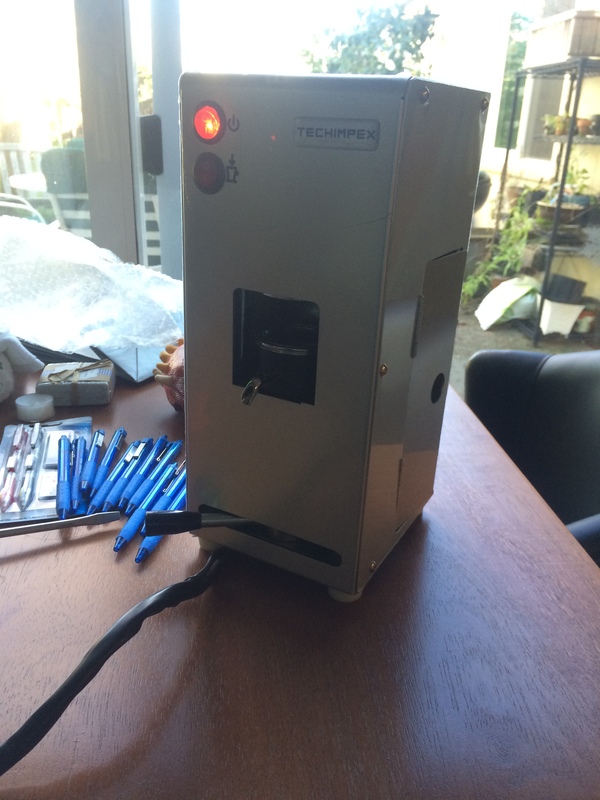 So somehow, Richard found an espresso machine made only in Italy that runs off 12v power. The Techimpex is quite the high tech gadget, made by a company specializing in cooking appliances to be used mostly in yachts. It had a high sticker price, but my thinking was we were going to end up there anyway, so why not just bypass the interim expenses on systems we’d ultimately reject? So yeah, we got an Italian 12v espresso machine. Hey! Wondering where you bought this from. All sites I see are broken. Thanks so much!!! Hope to find one soon for an expedition trailer I am building.